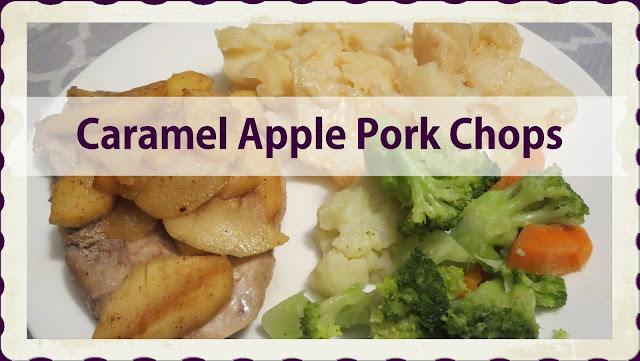 Tonight in my kitchen I will be making Caramel Apple Pork Chops. It has been so cool lately it really feels like fall is setting in so this is a perfect time to pull out some of my favourite fall recipes. I usually have everything on hand to make this recipe that everyone in my family loves. 1 - Heat a large skillet. Add oil and place pork chops in a hot pan. Cook for 5 to 6 minutes turning occasionally. Remove pork chops from skillet. 2 - Combine brown sugar, cinnamon, and nutmeg in a small bowl. Add butter to skillet and stir in brown sugar mixture and apples. Cover and cook until apples are tender. 3 - Add Pork Chops back into skillet cover and let simmer until sauce has thickened. 4 - When serving remember to serve with apple slices and sauce over the pork chops. Do you have a favourite meal that you make because you know you have the ingredients on hand?